P3W-924 is home to Ma'chello, an eccentric old man, and his unique inventions. One invention is a body-swapping device which is activated on an unsuspecting Daniel. Daniel finds himself in the body of a dying old man while Ma'chello, in Daniel's body, experiences Earth for the first time. O'Neill and Teal'c also fall victim to the device as their bodies are switched. When Ma'chello is finally returned to the SGC, he shows no remorse and insists the device is irreversible. 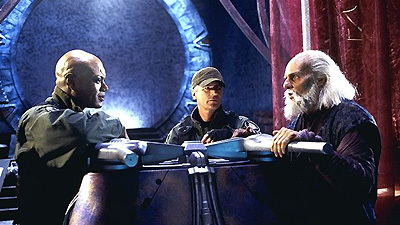 SG-1 must convince him to cooperate in an elaborate reversal, even though his own fragile body won't survive. Teal'c knew Ma'chello from images many years ago. Since before Teal'c was born, Ma'chello had been a fugitive from the System Lords. One of Teal'c's first assignments as First Prime of Apophis was to hunt him. He was developing advanced technology to battle the Goa'uld. He was captured and tortured and marked to become a host, but before the implantation he killed several Jaffa and escaped. Ma'chello explained that he was a soldier who fought many battles. He was captured and tortured, and lost all he loved and cared for. He continued to fight for 50 years until he was betrayed by his wife who had been secretly turned into a host. Two billion of his people died rather than turn him over to the Goa'uld. If it were not for his refusal to surrender, several System Lords would have conquered Earth. Ma'chello's electronic notebook database contained schematics of his inventions with icons and notes in an alphabet that is a mixture of ancient Latin and Greek, in form similar to his native language, but in an original language code. One of his devices was a type of life support system. The personality transfer device encrypts every transference and retains a memory, making reversal impossible. Kelno'reem is similar to hibernation or very deep meditation. In a state of waking sleep, the subconscious mind of a Jaffa becomes one with the symbiote, which allows it to repair an illness. Teal'c explains that his head must be shaved. Daniel lives at 1152 Mainland Street. O'Neill: while in Teal'c's body, suffered an illness requiring kelno'reem for the symbiote to repair.